February saw a high volume of condominium sales, bringing the overall residential sales numbers up 25.7%. A total of 58 condominiums were sold in February 2019-a 107% increase from the 28 total sold in February 2018. Single family home sales were also up 11.3%, with a total of 401 sales in February 2019 versus 317 in February 2018. New single family home listings were also up 28.7%, and condominium listings were up 17.5%. The overall average single family list price dropped 8.7% in February 2019, with an average price of $300,862, and the average sales price for single family homes dropped 8.6%, with an average selling price of $294,692. 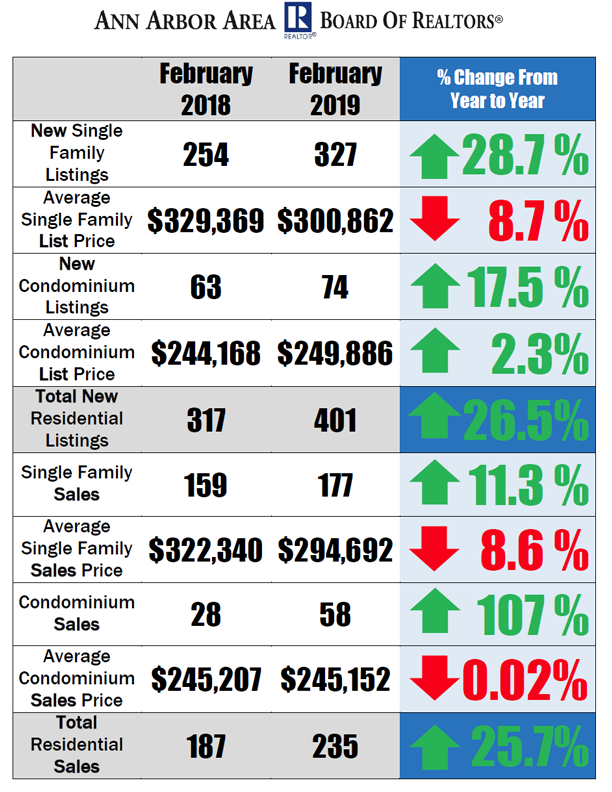 Average condominium list and sales prices stayed relatively unchanged, with just a 2.3% rise in the average list price and 0.02% decrease in the average sales price. The average days on market for single family homes decreased slightly, with an average of 51 days on market in February 2019, compared to 57 average days in February 2018. Condominiums, however, had an average of 55 days on market in February 2019, compared to an average of 19 days on market in February 2018. To see more Ann Arbor Area housing statistics, view the February 2019 Housing Statistics Report.